Gunma has four major onsen hot springs: Kusatsu, Shima, Minakami, and Ikaho. 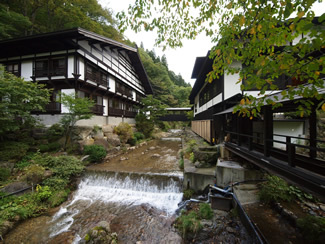 Hoshi Onsen is one of many onsen in Minakami. It is a secluded one located upstream of Hoshigawa River at 800 meters above sea level. It is said to have been found by Kobo Daishi, the master Kobo, a Buddhist high priest who lived 1,200 years ago.